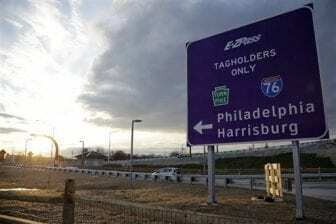 HARRISBURG, PA (WSKG) – The Pennsylvania Turnpike got some rare good news on Thursday. In 2007, the legislature and then-governor Ed Rendell passed Act 44, a law that mandated the commission pay $450 million to PennDOT every year. The money goes toward transportation-related projects around the commonwealth. The turnpike took on debt in order to make that annual obligation–today, about $6 billion of its total load stems directly from its PennDOT payments. In order to service the debt, the turnpike has raised tolls every year for the last decade–a 200 percent increase overall. Commission’s CEO, Mark Compton said in a statement that while he’s pleased about the provisional victory, the turnpike isn’t out of the woods. Most Pennsylvania officials–from Democratic Governor Tom Wolf to Republicans and Democrats in the House and Senate–appear to agree on at least the existence of a problem.